1. Check the label and calculate the dosage. 2. Swab the top of the vial with an alcohol wipe. 3. Pull the cover off the needle. Fill the syringe with air in the exact amount of the fluid you will withdraw from the vial. 4. Turn the vial upside down. 6. Inject the air into the vial. 7. Pull the plunger to withdraw the fluid. 8. Remove the needle from the vial and recap it. Select the site according to the physician's or nurse's advice. Wash hands thoroughly before preparing injection. Swab it with an alcohol wipe. It's important to rub hard, and allow the alcohol to dry before piercing the skin. Pinch the area to be injected; use your free hand, if possible. Quickly inject the needle 3/4 of the way in with a dart-like motion. Pull the plunger out slightly and check for blood in the syringe. If there is no blood, slowly inject the medicine. If you do get blood in the syringe, withdraw the needle and choose a slightly different spot. Dispose of the needle in a safe place! It is important to practice your technique before you give yourself or someone else a shot. Remember that subcutaneous injections are given at 45° angle; intramuscular ones are injected straight in. 1. Upper outer portion of the buttocks. Divide one cheek of the buttocks with two imaginary lines into four sections, or quadrants. 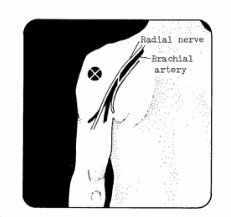 Choose the upper-outer quadrant for the shot, but avoid injecting near the major nerve and artery shown in the diagram. 2. The thigh. 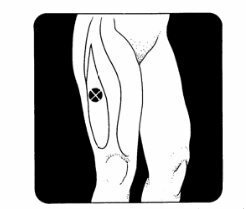 Choose a point on the outer surface, midway between the hip and knee. Check the diagram to see where this muscle tissue lies. 3. The upper arm (or Deltoid site). This can be found on the upper third of the arm, below the shoulder bone. it is approximately one-third of the way down from your shoulder to your elbow. Looking at the diagram you can see that injecting too low on the arm would bring you close to the major nerves and arteries which you want to avoid. There are many possible places where a subcutaneous shot can be given. Your nurse or physician will probably recommend several which you can alternate using. One site often chosen is the fleshy part of the upper arm, on the outer surface between the shoulder and elbow. 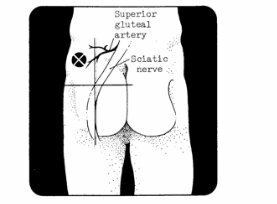 In order to reach only the subcutaneous (under the skin) tissues, the correct needle must be used, and inserted at a 45° angle to the skin. See the illustration below, which shows the correct position of the syringe. Remember, only non-irritating medications should be given this way. Your doctor or nurse will help you select the best size needle for your particular body build and type of injection.